CUTS Hanoi Resource Centre, with the support of the International Development Research Centre (IDRC – Canada), is implementing a two-year project entitled “Study on Unfair Trade Practices in select ASEAN countries”, in cooperation with research partners in Indonesia, Malaysia, the Philippines, Thailand and Vietnam. The overall objective of this project is to generate and promote substantive discussions/ dialogues in the Association of Southeast Asian Nations (ASEAN) on issues related to unfair trade practices (UTPs). This is expected to lead and contribute to the improvement of the relevant legal and institutional frameworks in ASEAN countries that seek to sustain a fair business environment therein and ensure equitable market outcomes in the long run. 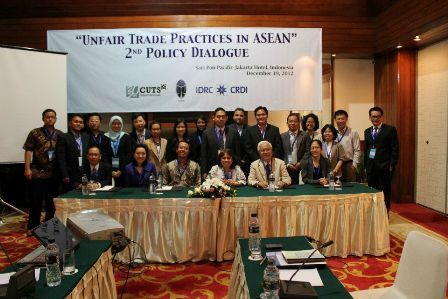 This policy dialogue, designed as a forum for sharing the research findings and policy recommendations of the project with competition and consumer protection agencies in the ASEAN region, as well as other relevant stakeholder groups, for their feedbacks, is expected to contribute to the attainment of the specific objectives of the project. Depending on the outcome(s) of this policy dialogue, a second event would be organized in Jakarta (Indonesia), tentatively in late November 2012, either to follow up on the results of this policy dialogue and discuss on a possible extension/deepening of the current project; or to bring the whole exercise to a cumulative end. The first policy dialogue was organised during the 12th of September, 2012 at Caravelle Hotel, 19 Lam Son Square, District 1, Ho Chi Minh City, Vietnam.